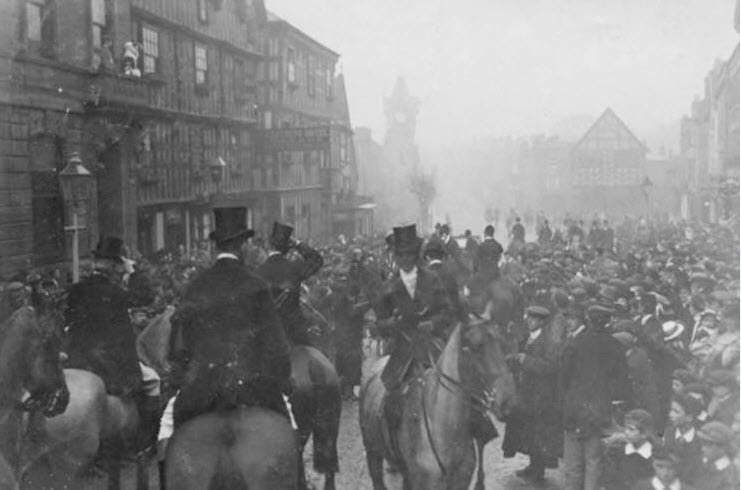 Ledbury Hunt meeting at the Feathers Hotel on Boxing Day of 1909. 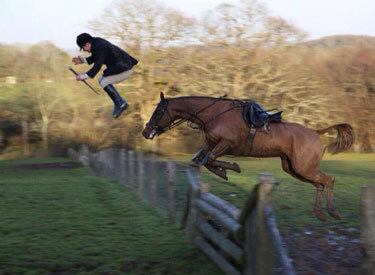 Fox Hunting, Horseback Riding, Oooops! 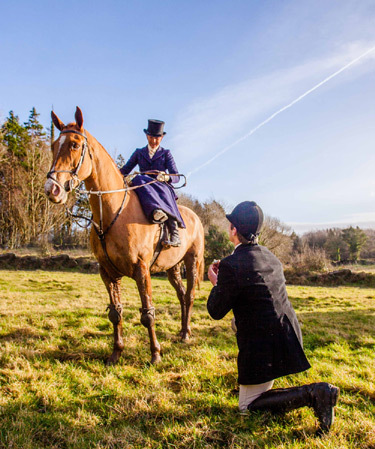 William McMahon proposes December 22nd to Grace Maxwell Murphy while out with the Galway Blazers. 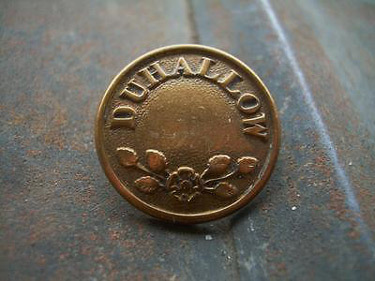 Photo by Siobhán English. 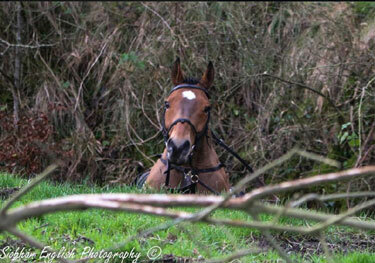 This photo was deservedly promoted from Facebook to the Chronicle of the Horse Siobhán English is the best hunt photographer out there. You go out very early, around dawn, while it’s still cool. 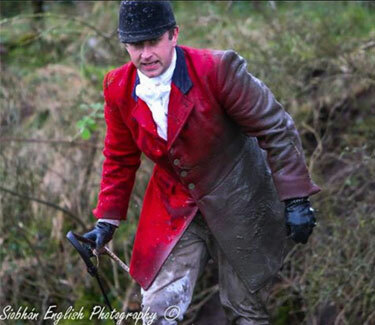 The hunt staff and field are less formally dressed for cubbing, wearing brown boots, tweed jacket and four-in-hand tie, a form of dress referred to as “Ratcatcher.” When it is really warm, standards of dress may subside to the level of polo shirts. My God! What a Fall! 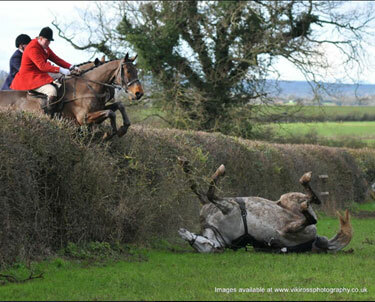 The ground must have been soft that day because both Alice & Chocky survived without serious injury. 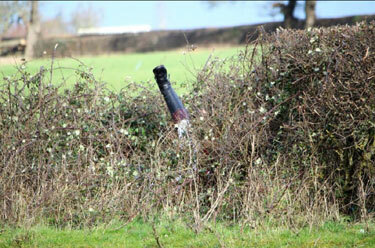 If you can follow the link to Facebook, you can see the whole nearly disastrous sequence. Photo: Ginni Beard, forwarded by Niall Hannity. Abel Davis riding an event course on Solvay. Catching up with my back issues of Chronicle of the Horse, I found in the December 16, 2013 issue the obituary of another great sportsman. Horseman Abel Davis died at the University of New Mexico Hospital in Albuquerque on Sept. 30 due to complications from a chronic spinal cord injury. He was 88. Mr. Davis was born on Feb. 14, 1925, to Gen. Abel Davis and Marjorie Mayer Davis in Glencoe, Ill.
At 18, Mr. Davis was drafted into the 14th Infantry Division of the U.S. Army. He served in World War II, and on Jan. 1, 1945, he was shot five times during the Battle of the Bulge. He received a Purple Heart and spent 1½ years recovering in Virginia hospitals. Mr. Davis’ first job was selling “Big Yank” overalls. He moved to Chicago, where he started one of the first direct mail businesses in the country, National Business Lists, and raised four children with his wife of 46 years, Susan Frank. He spent free time foxhunting and skiing with his family in Aspen, Colo., and moved permanently to Tesuque, N.M., after he sold the business in 1968. Together with Philip Naumberg, Jim Alley and Jim Ritchie, he established the Santa Fe Polo Grounds (later renamed the Santa Fe Horse Park and now called the Santa Fe Equestrian Center). 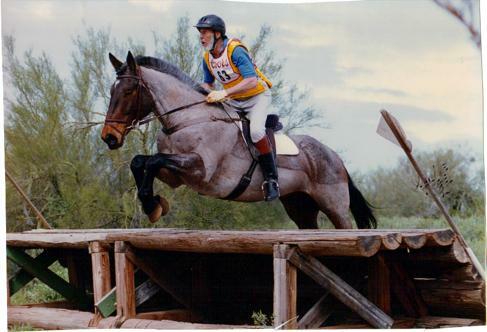 When his cardiologist advised him to quit polo, Mr. Davis took up three-day eventing at Goose Downs Farm (N.M.). 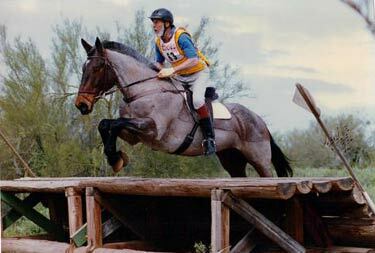 “I think his doctor only agreed because he didn’t know what three-day eventing was,” said Audrey Hays, his second wife. At 75, Mr. Davis achieved his goal of competing preliminary with his mount, Sir Francis Drake. In addition, he was a whipper-in for the Juan Tomás Hounds (N.M.) for 20 years. At 80, he broke his neck in a jumping accident, but he still took dressage lessons after recovering. He was a founding member of the Tesuque Volunteer Fire Department and an avid animal lover, who was known for his pack of red Dobermans. Mr. Davis was preceded in death by his wife, Susan, and daughter, Leslie Davis. He is survived by his second wife, Audrey; his daughter Patricia Willson and her husband, Rich, of Albuquerque; his daughter Lauren Davis and her husband, Charles Stathacos, of Croton, N.Y.; his son Jad Davis and his wife, Sarah, of Santa Fe, N.M.; his son-in-law Bill Lazar and his wife, Lynn Rosen, of Bozeman, Mont. ; and four grandchildren. Our hunting friend from the British Lakeland Fells, Ron Black, forwarded this delightful video of several sessions of pub singing back in 2000 of hunting and humorous songs, doubtless featuring friends and neighbors of his own from the North of England. the Archives of Never Yet Melted in the 'Fox Hunting' Category.